I was contacted by a young couple who had purchased a charming bungalow that they love except for the dysfunctional kitchen and laundry room. The kitchen was about 10 foot by 11’-6”, plus a bay window area. The laundry room was a separate 4’-9” by 11’-6” with a door to the kitchen, an adjacent bathroom and the exterior door. Therefore the room did not have the functional space needed for this family of four. I developed a floor plan that would remove the wall between the kitchen and laundry to create one large room. The door to the bathroom would be closed up. It was accessible from the bedroom on the other side. The room became 14’-10” by 11’-6”, large enough to include a small center island. Then I wrapped the perimeter walls with new white shaker style cabinets. We kept the sink under the window but made it a focal point with a white farm sink and new faucet. The range stayed in the same location below an original octagon window. The opposite wall is designed for function with full height storage on the left and a new side-by-side refrigerator with storage above. The new stacking washer and dryer complete the width of this new wall. 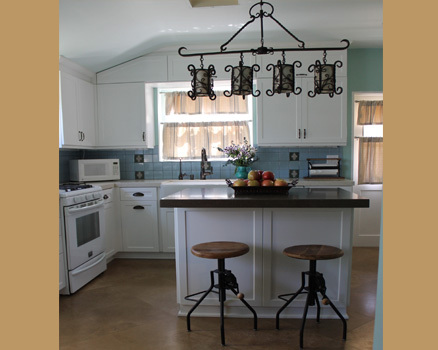 The shaker cabinets are complimented with 2 different colors of Caesarstone countertops. The perimeter is off-white with beige & gray speckles, while the center island has more contrast with the “Wild Rice” Caesarstone. In keeping with the Spanish architectural influence, a classic Spanish accent tile is featured on the backsplash. The flooring is travertine, 18” square tiles laid on the diagonal with tight grout joints. The ceiling has new LED recessed light fixtures for general lighting. The island and breakfast table have pendant lights that add more design details to the room. The bay window alcove was fitted with a custom bench with storage. A new table and chairs finish the space, accented with colorful framed art and accent pillows. The completed remodel created a functional but cheerful space for the whole family.